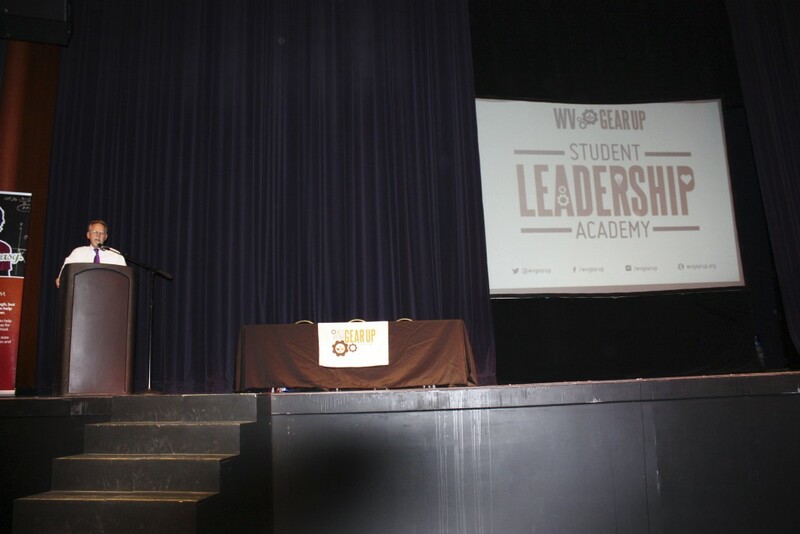 CHARLESTON, W.Va. – More than 1,300 eighth graders attended the West Virginia ‘GEAR UP’ Student Leadership Academy held yesterday at the Clay Center for the Arts and Sciences. ‘GEAR UP,’ which stands for “Gaining Early Awareness and Readiness for Undergraduate Programs,” is a federally funded college readiness program coordinated by the West Virginia Higher Education Policy Commission. During the event, students learned about college options and the importance of developing their leadership skills to take charge of their futures. Kendyl Ryan, a graduate of the West Virginia GEAR UP program, said GEAR UP has taught her to take action in pursuing her dreams. College mascots from Concord University, Fairmont State University, Marshall University and West Liberty University participated in a “Mascot Mania” dance-off competition during the event. A panel of judges scored their performances based on technique, presentation, entertainment value and integration of college knowledge. The panel awarded the “Mascot Mania Title Belt” to West Liberty’s mascot, Topper, who is played by recent West Liberty University graduate Corey Klug. Students who participated in the academy were entered to win one of three $250 scholarships donated by the keynote speaker, Aric Bostick a nationally recognized leadership coach. Shannon Carter from Bluefield Middle School, Hunter Davis from Hacker Valley Elementary School and Garrett Noe from Burch Middle School were selected. Each student will receive $250 in a SMART 529 College Savings Plan. The West Virginia GEAR UP program provides college planning and readiness services to students in ten counties, including Boone, Fayette, Mason, Mercer, Mingo, Nicholas, Summers, Webster, Wirt and Wyoming. For more information on the West Virginia GEAR UP program, visit www.wvgearup.org. Video of all four mascots dancing together begins at the 10:00 mark. Video of the crowd and student reactions begins at the 11:50 mark. Video of Topper being declared the mascot mania champion begins at the 13:45 mark. Dr. Paul Hill, Chancellor of the West Virginia Higher Education Policy Commission, stressed the importance of pursuing higher education to 1,300 eighth grade students who attended the West Virginia GEAR UP Student Leadership Academy. Mascots from Concord University, Fairmont State University, Marshall University and West Liberty University participated in the “Mascot Mania” dance-off contest held during the West Virginia GEAR UP Student Leadership Academy. 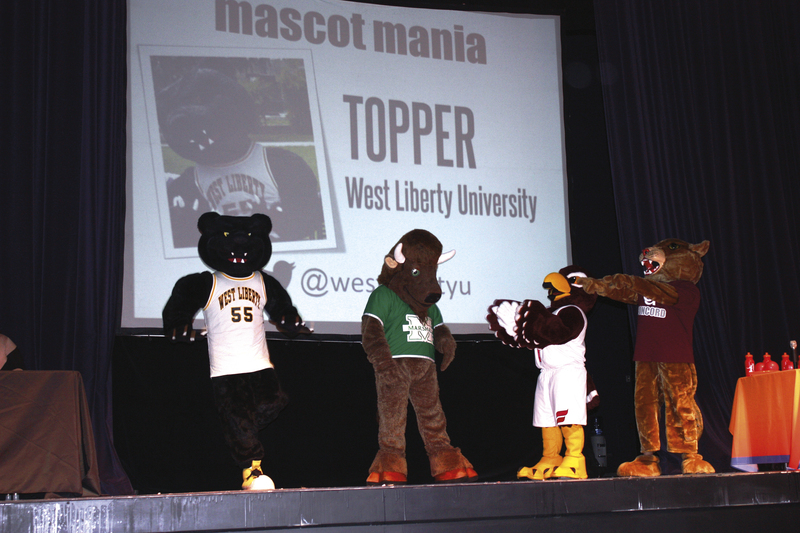 West Liberty’s mascot, “Topper,” (recent graduate Corey Klug) won the competition. 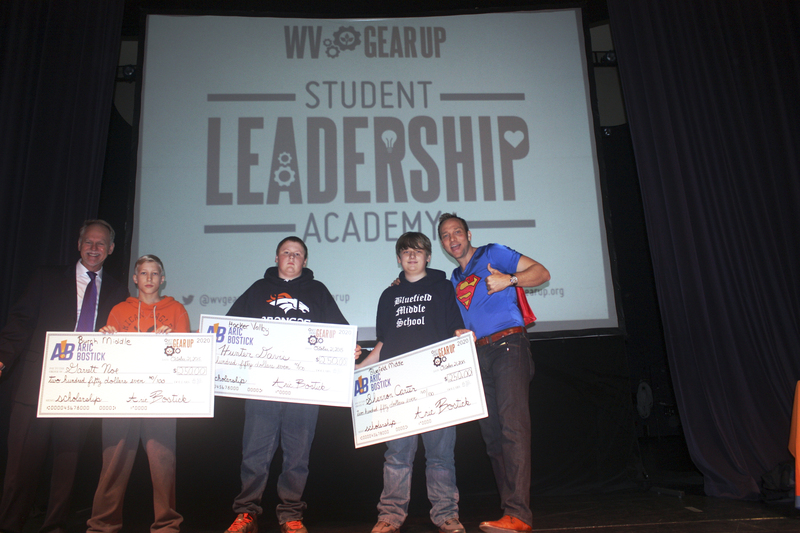 Shannon Carter from Bluefield Middle School, Hunter Davis from Hacker Valley Elementary School and Garrett Noe from Burch Middle School were each selected to receive a $250 college scholarship for their participation in the West Virginia GEAR UP Student Leadership Academy.